In the State of Georgia, 1 in 68 children are born in the spectrum of Autism. Inside I, a world-premiere now showing at 7 Stages Theatre, brilliantly showcases a portion of the life—birth through 18—of one young person living on a more misunderstood side of Autism, one who also is a lovable character and one who endears compassion, empathy and understanding. One of the things that you'll learn about Autism in this experience is that "If you've met one person on the spectrum, you've met ONE person on the spectrum." That's to say that every person who lives with Autism is living a different experience. 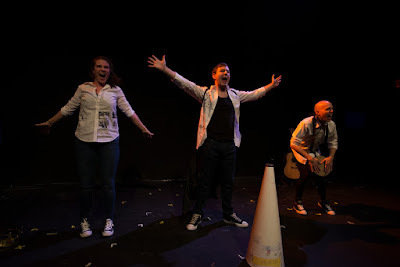 I Direct Myself is a magnificent 15-minute show presented before Inside I, written by and starring Sam Gross, a 7 Stages intern living on the spectrum who has been working at the theatre for a long time. Sam's passion for acting is immediately apparent. His performance is wonderful and wholly brilliant. This young man is also quite brave...he's doing something I've never, ever considered doing—acting on stage before a live audience. I believe you're going to love his performance...for which he received a generous round of applause at the performance I attended. Congratulations, Sam! 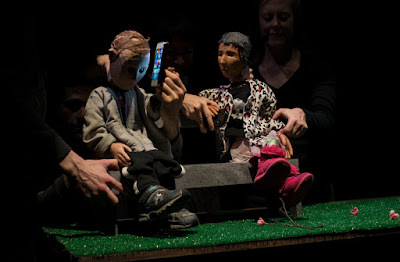 Inside I utilizes multiple technologies, including live-feed camera, large-screen projection and smartphone technology, and is performed, rather surprisingly, via masterful and magnificently acted puppetry. This story features episodes of the life and dreams of character named Ben, from birth to age 18, who lives on the spectrum and it tells the tale of his obsession with, and escape into the world of video—early on with his mother's smartphone and later with one of his own. The large-screen projections feature Ben's perspective via projections from his smartphone—his view of the world...giving "voice" and image to life on Autism's spectrum of unheard and unseen effects, including the heartbreak and love of family and the bullying of kids who have no understanding of what they're seeing. 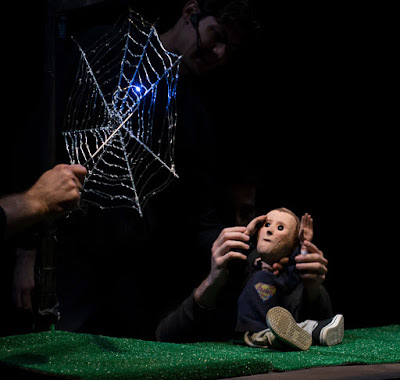 This play delves deep into one of the many possible experiences of Autism, offering an insight unlike any other I've ever seen. I had the honor of meeting a number of the actors, as well as Michael Haverty, one of the creators of Inside I, immediately after witnessing him bringing food to a peaceful homeless person on the street. Michael didn't see that I saw him, that I saw an act of friendliness and compassion. It was a touching moment and the conversation with him afterward about the play was insightful and quite riveting. Of the actors I met, and I'm grateful for every one that I met, it was a great honor to meet Suzi Bass Award-winner Matt Baum, who performed the role of Ben, the main character. Talk about range...it's not often that you see someone on stage perform the role of a character from birth to 18. Matt did so brilliantly and quite convincingly. His wife was also in attendance and is wholly delightful. On Saturday, May 7 at 2:00 p.m. there will be a sensory-friendly performance of Inside I. Feel free to call the theatre for more details about this particular performance. I also encourage you to listen to this interview with Inside I co-creators Michael Haverty and Erwin Maas. While Inside I is geared to a neuro-typical audience—people not living on the spectrum—many who have Autistic children, know someone (or many) who live on the spectrum, research Autism, are caregivers, and advocates, are showing great interest in the show. I personally have known a couple of mothers of Autistic children, but my exposure has been extremely limited, so I'm grateful to 7 Stages for bringing this show to the Atlanta community...I learned a lot, enjoyed the performances immensely and left equipped to better understand, sympathize and share 7 Stages' mission with this play to help spread awareness of Autism. You can see I Direct Myself and Inside I at 7 Stages Theatre now on stage through Sunday, May 8, 2016.